Step out in style with JENIA Unisex Multilayer Adjustable Genuine Wristband Wrap Cuff Bracelet! A premium quality genuine leather wristband wrap bracelet for classic gentlemen and ladies, you will love how this exceptional unisex statement hand accessory jewelry complements your outlook while making an incredible impression on your looks. As with all JENIA's products, our Unisex Multilayer Adjustable Genuine Wristband Wrap Cuff Bracelet Jewelry is always well-appreciated as a gift item to trendy ladies, gentlemen and young adults alike. You can send it to a loved one as a birthday present, for graduations, holidays, Christmas, or any gift giving occasion. DO FALL VICTIM TO IMITATIONS! 100% SATISFACTION and Money Back GUARANTEED when you buy our products directly from us. We are always happy to give our customers an exceptionally remarkable shopping experience and will replace or refund if the product is defective, breaks or you are not satisfied - no risk no problem when you order today. Dress Uniquely and in Style! Click the "ADD TO CART" button at the top of the page to order your Unisex Multilayer Adjustable Genuine Wristband Wrap Cuff Bracelet! Superior quality: we carefully craft all our leather wrap bracelets with rare, top grade materials to ensure you get a fine, artistic leather wristband. you will love our 100% genuine leather made to satisfy your fancy taste. neatly finished to ensure long-term durability. Perfect outfit compliment: our fashion leather multilayer bracelet blends perfectly with your outfit of the day giving you a unique yet classy look. 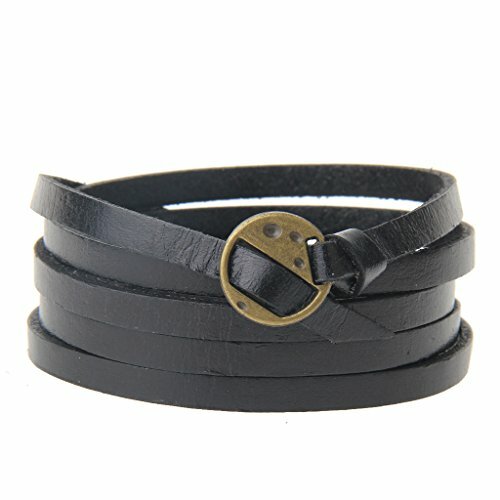 accessorize with this leather bracelet while you attend parties, go for dates, or go for occasions and stand out. An fashionable design: our stylish leather cuff bracelet features a unisex design. custom designed to suit your different outfit giving you that chic, eye-catching overall appearance. the best way to accent your hand. Great size: with dimensions; length is 41.3inch width is 0.23inch, this black multilayer wristband offers an amazing wrist fit. a comfy 12g lightweight design ensures you can wear your bangle all day long without much fuss. we also custom fit a alloy wear buckle to securely hold your sleek bracelet around your wrist. An surprised gifting idea: the timeless craftsmanship of this genuine leather bracelet makes it a thoughtful yet classic gift for your special friend on valentines, birthday, party or on any special occasion. get this soft leather bracelet and show how much you care! If you have any questions about this product by Jenia, contact us by completing and submitting the form below. If you are looking for a specif part number, please include it with your message.